William Dawson was born in Philadelphia. He spent most of his youth on the coast of northern New Jersey and in Bucks County, Pennsylvania. His interest in art developed at an early age, when he spent many hours sketching and painting everything that came into view. In 1955, Mr. Dawson moved to Delaware where he continued to paint while he maintained a career in marine construction. William Dawson obtained his formal art education at the Philadelphia College of Art. Additional training has come from workshops with accomplished artists, extensive reading, and self study. 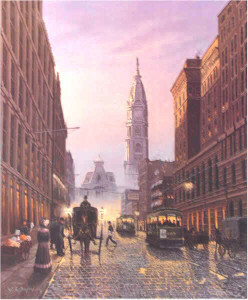 Historical scenes of Philadelphia and Delaware have become a significant area in which he works. A highly versatile and talented artist, Mr. Dawson painted in a realistic style. His artwork creates a visual experience and offers an opportunity to reflect upon events of the past and to transport the observer to quieter, gentler times of the past. William Dawson passed away in 2007, but he remains an artist who reminds us of a time and place.